1 Halve avocado lengthwise, remove pit and scoop out the pulp with a spoon. Immediately sprinkle with the lemon juice and mash well with a fork. Peel the garlic and squeeze through a press. Peel the onion, chop finely and add. Season to spicy with salt, pepper and Tabasco. 2 Preheat oven to 220°C. 3 Rinse strawberries, trim, cut in half lengthwise and cut lengthwise into fine leaves. 4 Rinse the basil, shake dry, chop coarsely and fold into the avocado puree. 5 Lay baguette slices on a baking sheet and toast in hot oven 3-5 minutes. 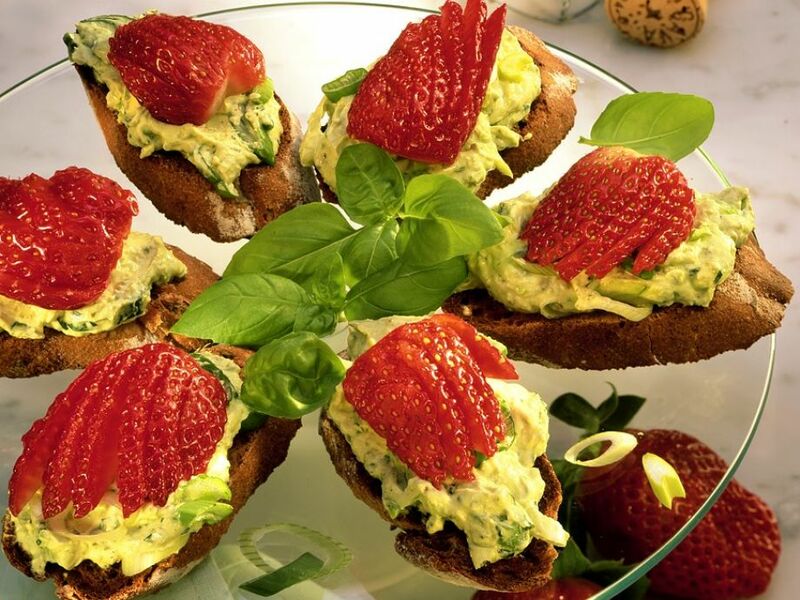 6 To serve, spread the still hot slices with avocado puree and top with the strawberries.